When Mark Twain coined the term "Gilded Age," he described a time of wealth, economic growth, and political change. Travel back to that exhilarating era with nine couples who work to build a future for themselves and their families as they fight for social reform, take advantage of new opportunities, and grow in faith and love. 448 pages, softcover from Barbour. Journey along in nine historical romances with those whose lives are transformed by the opulence, growth, and great changes taking place in Americas Gilded Age. Nine couples meet during these exhilarating times and work to build a future together through fighting for social reform, celebrating new opportunities for leisure activities, taking advantage of economic growth and new inventions, and more. Watch as these romances develop and legacies of faith and love are formed. In the hell-on-wheels rail town of Cheyenne, grieving Boston socialite Dara Forsythe must choose between her estranged father; Connor, a bigwig with the Union Pacific Railroad; and Gage Wells, a former Confederate sharpshooter bent on derailing the Transcontinental Railroads progress. Guarded industrialist Beck Emerson agrees to sponsor his sisters all-female baseball team. But when pretty pitcher Winnie Myles throws a curveball that makes him team manager, it challenges his plan to play it safe in life and love. May Bolen offers Sam Austin a marriage of convenience. He will get to run the company that drove his into bankruptcy, and she will be free from her fathers rule to travel the world. But when Sam meets May, he knows the offer is too good to be trueor convenientwhen hearts become tangled. In order to bring her starving family to New Jersey, Polish immigrant Marcella Lipski must marry wealth. So she takes Americanization lessons from the poor-but-mysterious cart driver teaching her Englishand loses her heart in the process. Ladies Aide Chairman, Amanda Carston resolves to clean up St. Pauls ramshackle housing, starting with the worst of the worst: a "haunted" house thats secretly owned by her beaua home thats his only means of helping brothel girls escape from the hands of the citys most infamous madam. Beryl Valentine, a socialite with a passion for horses, finds herself falling in love with her riding instructor, a man her parents will never accept. Will she follow her parents wishes, or let Gard Kennedy ride away with her heart? The reclusive daughter of a fly-fisherman guide must read the waters for a wealthy gentlemans sport and send him back where he belongs before he hooks her heart and takes her away from the river she was born to love. When the nephew of a prestigious Chautauqua resort founder sets his eye on the new library assistant believing her an academy student, it will take more than reciting poetry for love to bloom when he learns shes the humble gardeners daughter. 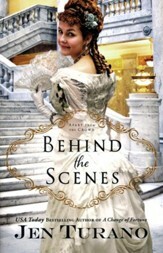 Reputations and jobs are on the line when ladys maid, Lucy Taylor, and neighboring footman, Elijah Boyer, compete against each other for a place of honor during the annual community appreciation event hosted by their wealthy employers. Michelle Griep has been writing since she first discovered blank wall space and Crayolas. She seeks to glorify God in all that she writesexcept for that graffiti phase she went through as a teenager. She resides in the frozen tundra of Minnesota, where she teaches history and writing classes for a local high school co-op. An Anglophile at heart, she runs away to England every chance she gets, under the guise of research. Really, though, shes eating excessive amounts of scones while rambling around a castle. Michelle is a member of ACFW (American Christian Fiction Writers) and MCWG (Minnesota Christian Writers Guild). Keep up with her adventures at her blog "Writer off the Leash" or visit michellegriep.com. Natalie Monk is a member of the American Christian Fiction Writers and is represented by Tamela Hancock Murray of the Steve Laube Agency. A country girl from the time she could shimmy under a string of barbed wire, Natalie makes her home in North Mississippi, where she proudly wears the label "preachers kid." She is a homeschool graduate, part-time virtual assistant, and former post hole digger. She loves porch swings, old-fashioned camp meetings, and traveling with her familys singing group. Her goal in writing, and in living, is to bring glory to her Savior, Jesus Christ. Come chat with her on her website: www.nataliemonk.com. Jennifer Uhlarik discovered the western genre as a preteen, when she swiped the only "horse" book she found on her older brothers bookshelf. A new love was born. Across the next ten years, she devoured Louis LAmour westerns and fell in love with the genre. 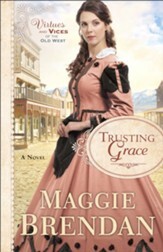 In college at the University of Tampa, she began penning her own story of the Old West. Armed with a BA in writing, she has won five writing competitions and was a finalist in two others. In addition to writing, she has held jobs as a private business owner, a schoolteacher, a marketing director, and her favoritea full-time homemaker. Jennifer is active in American Christian Fiction Writers and is a lifetime member of the Florida Writers Association. She lives near Tampa, Florida, with her husband, teenage son, and four fur children. Professional coffee drinker, Jaime Jo Wright resides in the hills of Wisconsin. 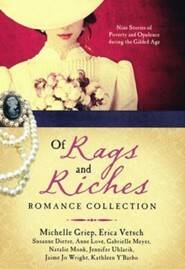 She loves to write spirited turn-of-the-century romance, stained with suspense. Her day job finds her as a Director of Sales and Development. Shes wife to a rock climbing, bow-hunting Pre-K teacher, mom to a coffee-drinking little girl, and a little boy she fondly refers to as her mischievous "Peter Pan." Jaime completes her persona by being an admitted social media junkie and coffee snob. She is a member of ACFW and has the best writing sisters EVER! Bestselling author Kathleen YBarbo is a multiple Carol Award and RITA nominee of more than eighty novels with almost two million copies in print in the US and abroad. She has been nominated for a Career Achievement Award as well a Readers Choice Award and is the winner of the 2014 Inspirational Romance of the Year by Romantic Times magazine. Kathleen is a paralegal, a proud military wife, and a tenth-generation Texan, who recently moved back to cheer on her beloved Texas Aggies. Connect with her through social media at www.kathleenybarbo.com. 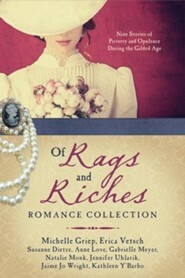 I'm the author/artist and I want to review Of Rags and Riches Romance Collection: Nine Stories of Poverty and Opulence During the Gilded Age.